Another early morning. 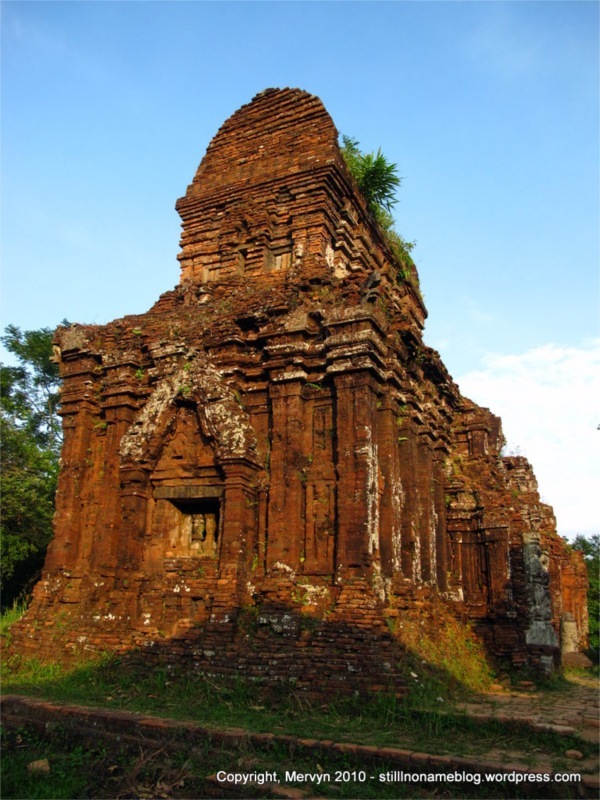 Today I jetted out to My Son (pronounced: Mee Sun), the ruins of the Champa civilization. 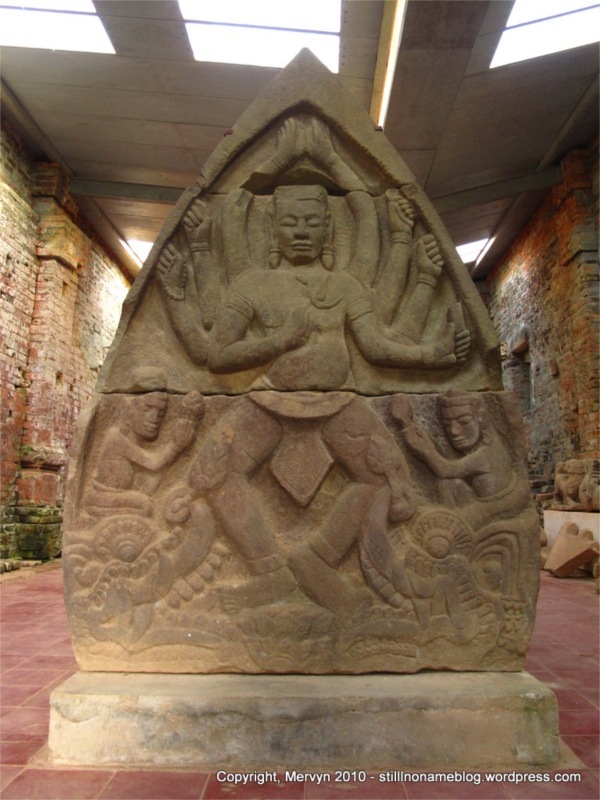 The Champa kingdom held sway in the area between the 2nd and the 15th centuries. My Son used to be an intellectual and spiritual center of the empire. The ruins were more ruined after the American War. 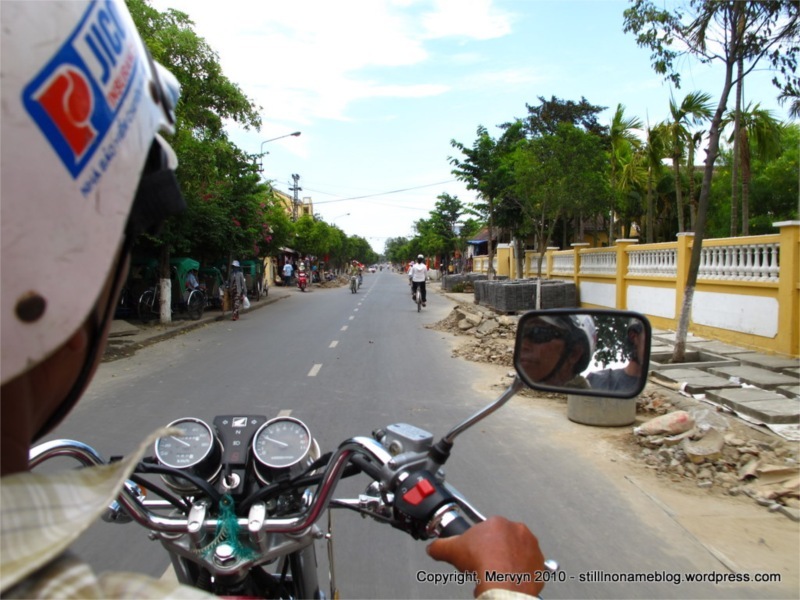 I set off at 5 a.m. on the back of my motorcycle guide’s Honda cruiser. Using my experience from the last day at Angkor Wat, I decided to get an early start to beat the heat and get some decent light to take pictures. I’d planned on doing this on my own on a motorbike, but opted for a guide instead. My decision seemed like a good one considering it took us an hour to get there and the route didn’t seem totally straightforward. We arrived at 6 a.m., but there were already a couple groups of tourists there wandering the small complex. I’ll keep this short. After seeing the expansive ruins of Angkor Wat near Siem Riep, Cambodia, My Son is miniscule in comparison. It does offer different, unique architecture, but if you’re templed out after Angkor Wat, this isn’t going to revive your passion. That said, it is decent. Afterwards, we headed out to Marble Mountain. The trip through the countryside gave me an unexpected experience. On the way into My Son, we’d driven through villages and fields. Some farmers were already out turning over the earth with tractors or caribou in preparation of the next round of seeding. Now the farms were in full swing. 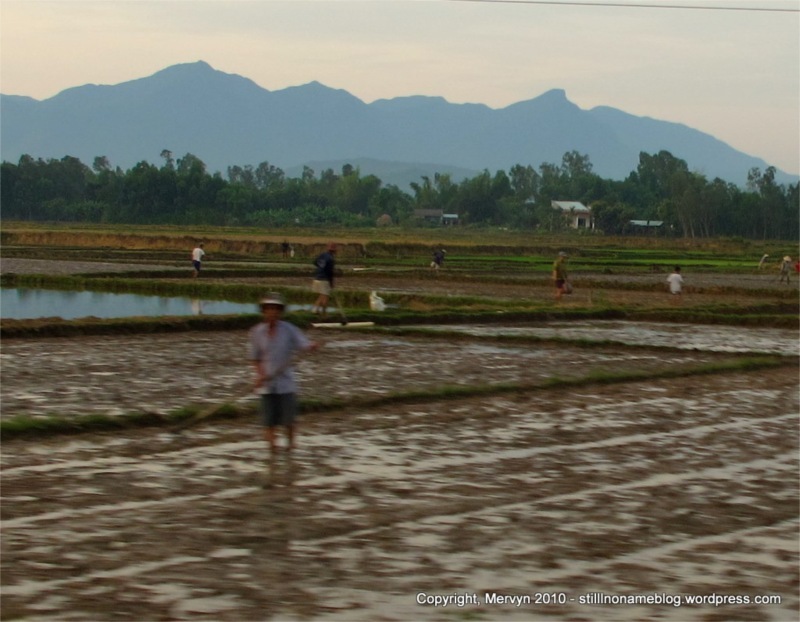 Men and women were out tending to the rice paddies. It was barely 7 a.m. and they were already deep into the fields toiling away. As we zipped by, my driver honked at oncoming traffic, people tending roadside shops, and kids playing badminton. I soaked in the countryside and contemplated my fortune. My grandparents owned a farm in the Philippines and pure happenstance spared me from tending fields similar to these. Far from the climate controlled high rises of San Francisco, people like me still got up before dawn to grow rice. A lot less separated me from this world than you might think. We arrived at the Marble Mountains and I ascended the steps to the plateau of the most famous, Thuy Son. Where My Son offered something all too familiar, Thuy Son presented something unique. The mountain is one of a number of peaks that somewhat resemble the rock outcroppings of Railay, Thailand. Local artisans used to mine these hills for marble that they carved into works of art. These days they wisely get their marble from China and leave the tourist attraction untouched. 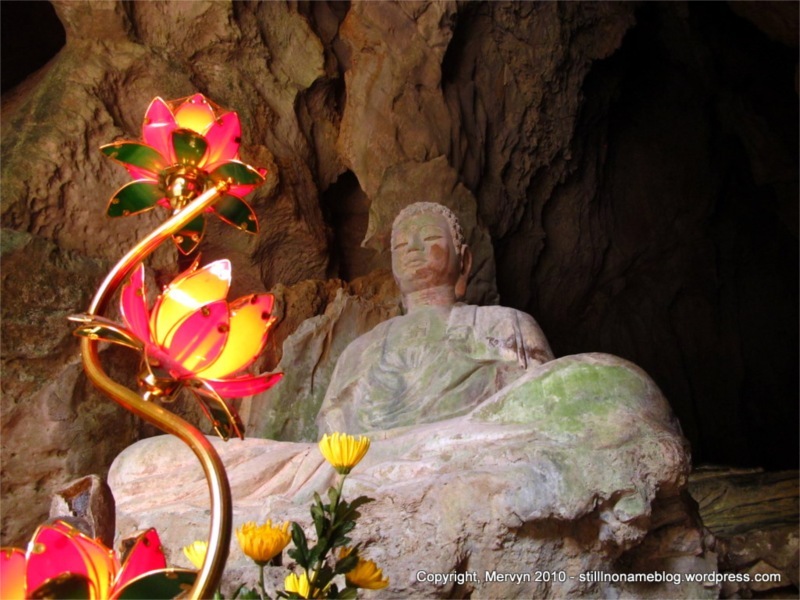 Carved into Thuy Son’s rock are Hindu and Buddhist sanctuaries. 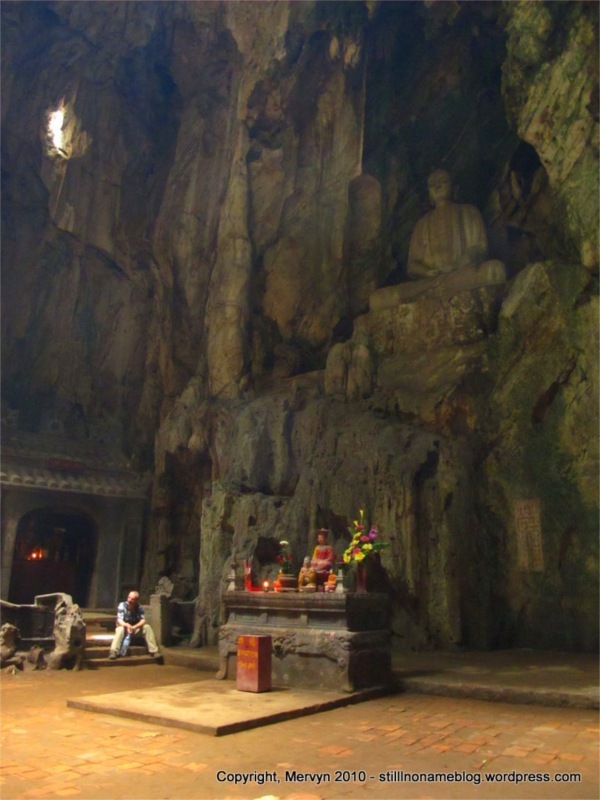 Most, like the statues in Dong Tang Chon (Tang Chon Cave) seem to be carved straight out of the cave rock (see pic at top). 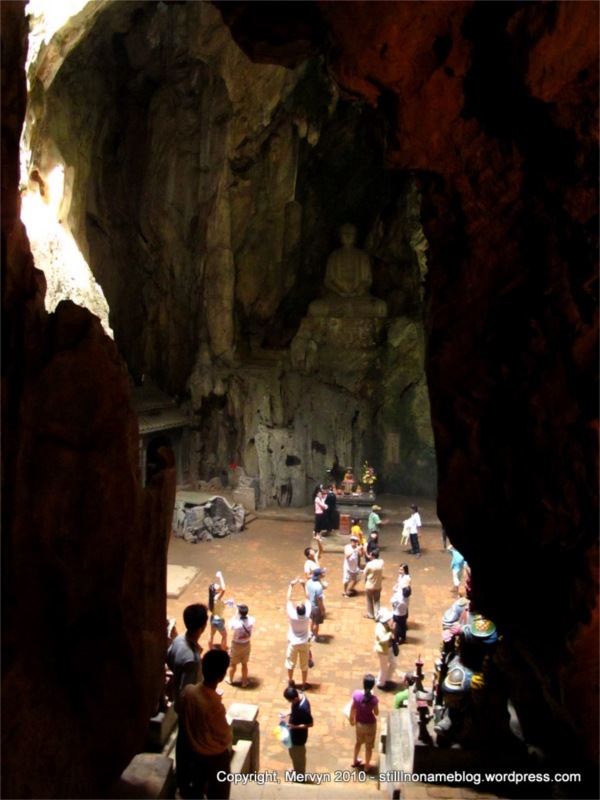 The most impressive is a chamber called Dong Huyen Khong (Huyen Khong Cave). I enjoyed a breeze that gusted over the top of the stairs overlooking the Buddhist and Confucian shrines below. That tiny feature added to the meditative feel of the natural cathedral, a sort of cool eye to the sun and heat storm raging outside. It’s also offers a bit of insight into the complexity of the American-Vietnamese War. The Viet Cong used this cave as a field hospital. 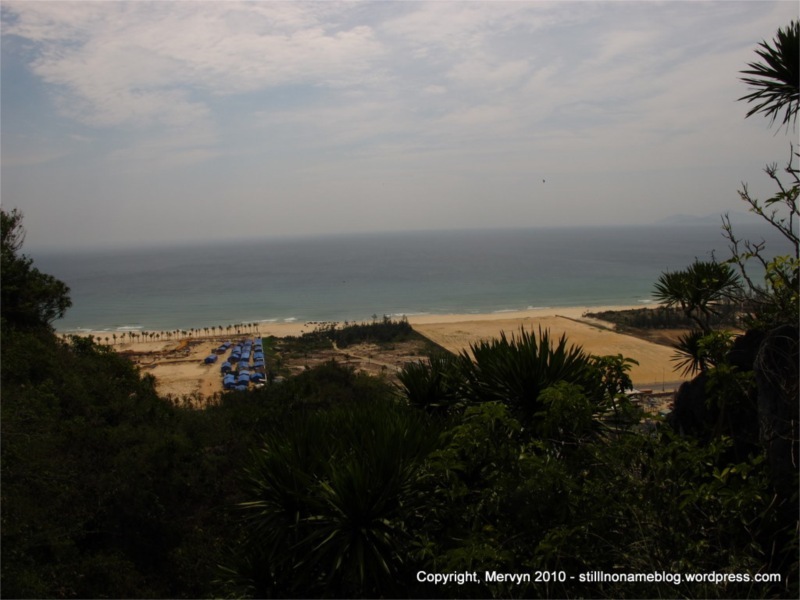 Just a few hundred meters away is China Beach, a name the Americans used to refer to a 30 km stretch of coast that starts at the Marble Mountains and stretches almost to Hoi An. Looking down from Thuy Son, one can see the ocean and sand of the spot just south of Danang that American soldiers from around Vietnam used as a place for a little R&R before returning to combat. This rest stop for U.S. soldiers was only a few hundred yards away from a treatment center for VC casualties. 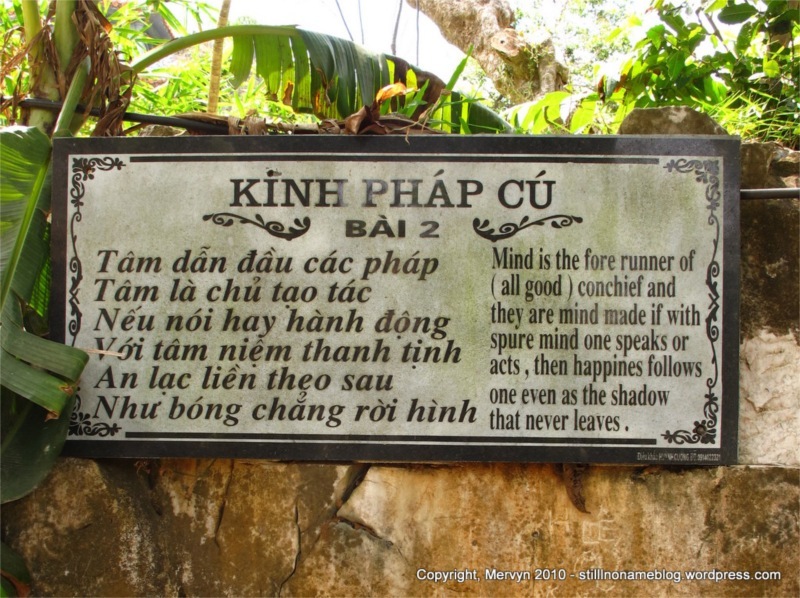 After a couple of hours exploring Thuy Son, I descended the mountain to meet my guide, Mr. Son. We made a short side trip to visit Thanh Ha, an artisan village specializing in traditional handmade pottery. They still use foot powered pottery wheels that sit on the floor. I watched a grandmother kick one of these to speed while her granddaughter sat cross legged on the floor as she threw pot after pot. The pots were then set out to dry in the sun then sealed into an old fashioned kiln where they were fired over the course of 3 days. 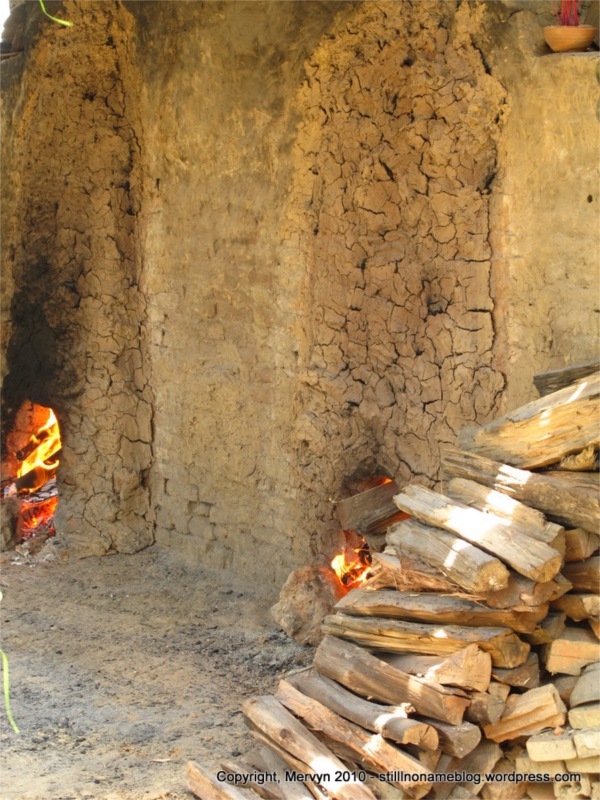 A man fed stacks of wood into the clay ovens in the midday heat. Even the heat for the kilns was handmade. Mr. Son then offered to take me to the beach near Hoi An. Here is one of Hoi An’s underrated pleasures. Something that, without my guide, I’d never have bothered to explore. I’m not much of a beach bum. I get bored too easily and I keep wanting to find some shade. This beach, though, was my kind of stretch of sand and ocean. Where the beach in Nha Trang was crowded, the beach here was nearly deserted. The water and sand were just as good as anything in much more touristed Nha Trang. Best of all, as far as I could see, there were a couple rows of comfy reclining chairs and umbrellas. Perfect for a breezy afternoon nap. 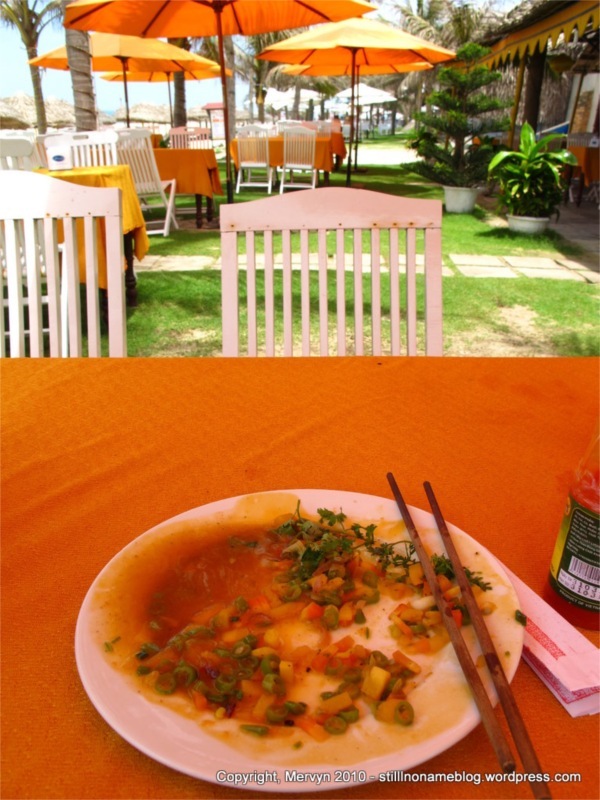 I had a simple lunch of wontons in a mango salad and took a cup of iced coffee under a shaded lounge chair. As I dozed I marinated in the perfect cap to a busy day. And it was only 1:30 p.m. This early to rise thing is a killer. I managed to fill the rest of the day with clothing fittings, dinner, and a stint of writing. I even booked a dive trip for the next day. I even get to sleep in–the dive company won’t pick me up until 7 a.m.
GALLERY: Click through to see bonus pictures of Mervyn’s favorite beach in Vietnam (so far), more My Son ruins, and the wondrous caves the Marble Mountains. I’m planning a trip to Vietnam this February and find your posts a great source of ideas and information. I especially like your archives list, very helpful.